You know that question interviewers throw in just to unsettle you? The one that goes: "And where do you see your career in five years' time?" Well, I was just taking my leave from the delightful Forgan family when something made me ask this question of a man who had so far only told me that he would like to show his work in local galleries. "Do I understand from that that you want to be a career turner?" I asked. "Yes," he said firmly, a determined gleam of anticipation lighting up his face. 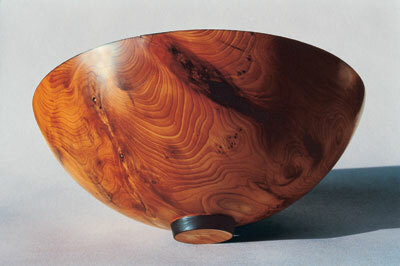 It is true that in a letter to Woodturning he had explained that he would love to spend all his time producing gallery/exhibition pieces, but that he was realistic about his young family's needs, his mortgage and his work as a diagnostic radiographer at Oxford's John Radcliffe Hospital. I had dismissed this as wishful thinking, but having met the man and seen what he can do in other areas of his life, I can see that he just might make a go of it. 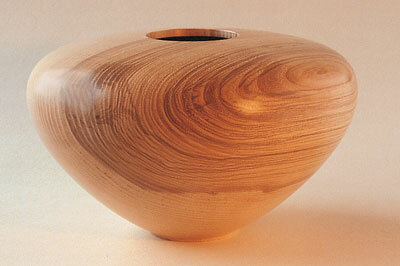 Gaining first place in the hollow forms category at last year's Axminster show for his carved piece in burr oak means he has already come a long way from his first attempts on a friend's lathe. When I visited he had just completed this year's secret project. We're talking at the family home in the delightful Buckinghamshire village of Brill, a few miles from Oxford, shared with his wife Sharon and boys Gregory, aged five, and Michael, three. Looking back over our conversation I realise that he has the sort of quiet confidence that results in achievement. To return to the interview analogy, Richard is the type who would call a problem an opportunity and then find a solution. He told me that when they bought the house 10 years ago it was just a shell. "I put a Rayburn in and went from there," he recalled. "I'm a practical person." The garden, with its neat lawn and natural willow wigwam for the children to play in, stretches down hill to overlook the Kidlington valley and the Vale of Aylesbury. Richard's workshop is an 8 x 10ft wooden shed. "I don't know what got me into turning," he said. 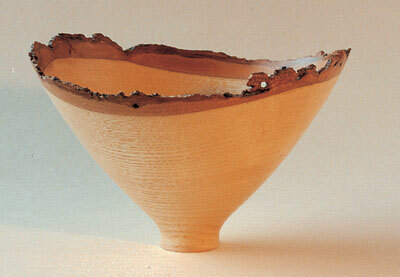 "I hated woodwork at school, and didn't like the teacher. I liked metalwork and wanted to go into engineering but I was persuaded when I left school to take a science course rather than engineering. I left college with a diploma in science and didn't know what to do next so drifted into radiography. "I've always been pretty handy and I had a friend at work, Graham Parcell, who did some turning and introduced me to it. 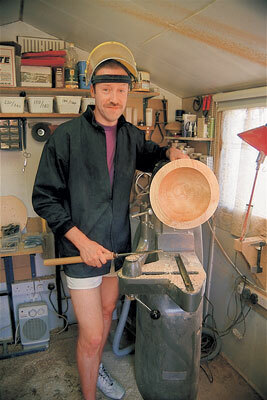 I went round to see him and he let me have a go at his lathe." That was some 10 years ago, and Richard went on to buy his Taiwanese lathe when Graham upgraded. "I set it up on the kitchen table," he recalled, Sharon adding with a grin that she was more lenient then. "There were woodshavings everywhere because we had just bought the house and we were gutting it," he said. "Most of my early pieces were awful and have gone into the Rayburn." Said Sharon: "He's a perfectionist if the truth be known. Much of his early work was taken up by the Rayburn." As Richard started seeing other people's turned work and reading books about it, particularly by Dave Regester, Reg Sherwin and Oliver Plant, so his own technique improved and ideas began to flow. "I was just practising. I spent quite a lot of time at it, thinking about it all the time in between doing the house." Richard continued to turn on his original lathe until early 1998 when he invested in his workshop and a Variturn short-bed Graduate from LRE which he had modified to take 2ft-diameter blanks. "Progress with the workshop was slow, however, due to a young son, but I still found the time to make acquaintance with a local tree surgeon and rough turn a lot of bowls. 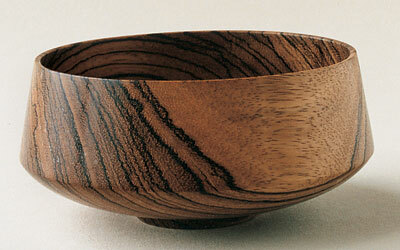 I still have about 50 rough-turned bowls under Michael's bed. Sharon's going to sell these at a charity event in the village, and the PTA of the local school is running an art exhibition and I'll put some pieces in that. "I don't really sell at the moment, but I would like to get a website up and running and may use it to sell. Maybe I could also get some in local galleries, like the Oxford Gallery and some craft places around here. That's the way I want to go, as time permits." He continued: "Early in 2001 I took my turning to another level by joining the AWGB, going to their seminar in Loughborough and working on a competition piece for the Axminster show." That piece, he said, was the only one that he had ever been completely happy with. "And the judges liked it too! Thank you." So why isn't he usually satisfied with his work? He replied: "There have always been parts that you could improve upon. That's what drives me." He likes all aspects of the craft, including colouring, carving, texturing and burning, and prefers a soft sheen or matt finish rather than a high-gloss finish. 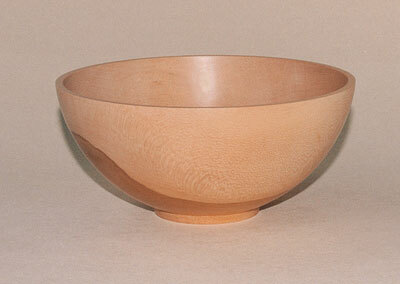 "I use mainly oil finishes or sanding sealer and wax, but I'll try anything," he said, adding that for any bowl that looked as if it could be used rather than just displayed he would play safe and finish with sunflower oil. While his early influences were Reg Sherwin and Chris Stott, he now looks to the work of William Hunter, Ron Fleming and Mike Scott, of whom he says: "Mike Scott has obtained enough mastery of his techniques that he can let his creative talents run free. This is something I definitely aspire to. A lot of different turners have influenced me in the past, both professional and amateur, and I am always open to new ideas and different ways of doing things. "I'll get an idea and I'll jot it down. I have a file stuffed full of ideas that I'll get round to doing. Most of the stuff I've done is improvements or stuff that's arisen from it. 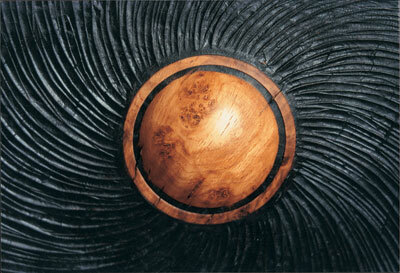 Some of the sculpture work that starts off round and ends up something else I wouldn't put out of the picture either." Richard works mainly in native hardwoods bought in blank form from Nigel Griffin at The Derby Woodturning Centre, and also buys the odd exotic and Australian blank. "I like to have a range of blanks for when I have an idea," he explained. Sharon added: "When he gets an idea he'll say he'll be back in five minutes, then three hours later he'll come back and say 'what do you think about this?'" Richard said: "I have only recently started to explore hollow forms, so I am going to continue with this in the near future. I have already used more carving on my pieces, but I am not ruling out the use of major carving, colouring, texturing, whatever, in the future." I get the feeling that the Rayburn won't be fed too many more turnings that fail to make Richard's exacting grade. "Most of my early pieces were awful and have gone into the Rayburn"